NEWS COMMENTARY: Norway’s so-called “agurktid” (cucumber time) in the news is almost over. That’s when, during the summer months, the news flow usually slacks off and media outlets often end up reporting on things like the price of cucumbers, for lack of anything more exciting. This year the price of celery in one particular store was at least a bit more dramatic. A couple of bored Norwegian journalists dubbed the less-than earth-shattering news often reported during summer as agurknytt (cucumber news) many years ago. It’s tied, however, to another summertime phenomenon in Norway, when the prices of standard produce items (like cucumbers and tomatoes) jump just as locally grown variations flood into local grocery stores. In most countries, prices come down when supply goes up. In Norway, the opposite occurs, mostly because Norwegian farmers are protected by tariffs placed on imported food items that are designed to make cheaper (and often better) imports just as expensive as their Norwegian counterparts like cucumbers and tomatoes. And not least celery. This became glaringly apparent on a routine errand to the local KIWI grocery store last week, where the price of celery caught this writer’s attention. Prices for fruit and vegetables at KIWI, which promotes itself as a billig (cheap) grocery store chain by Norwegian standards, generally do run lower than at other chains, even at those like Meny that also are owned by KIWI’s powerful parent company NorgesGruppen. And the Norwegian celery now on the shelves was indeed priced fully three kroner lower, at NOK 26.90 (USD 3.30), than at rival ICA, where it cost NOK 29.90. The saga of celery prices is an annual aggravation for consumers who are fond of the versatile vegetable and pay attention to what things cost in Norway. Only the week before, celery could be bought for just half the price, around NOK 15. 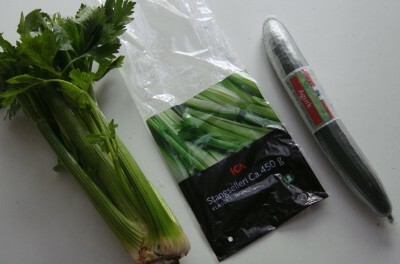 It was imported from Spain, which produces much lighter, less-fibery and less-bitter celery than the Norwegian farmers in Lier manage to grow. Now consumers were faced with a sign on the shelf noting that Stangselleri with land of origin marked as Norge cost nearly twice as much. The problem was that some of the older celery from Spain, clearly imported before local farmers started harvesting their own celery, was also still on the shelves. There was no pricetag for Stangselleri with land of origin Espana on the shelf though, so a clerk was summoned and asked what it cost. “Det samme (the same),” he replied. Why was there no separate price tag for the Spanish celery on the shelf denoting that? And why did its price double in the course of a week? He couldn’t answer and summoned the store manager. A discussion ensued. The undersigned could understand why the celery produced in Norway carried a much higher price than the Spanish celery, because of all the higher costs and politics involved, but why aren’t consumers allowed to continue buying the cheaper celery at its lower price at least for as long as it’s still available? He may have been regretting that the Spanish celery hadn’t been removed from the shelves and thrown out, but that’s another controverisial practice by Norwegian grocery stores. Their destruction of food items that are still edible has drawn scorn and in this case, the celery wasn’t tossed, just left for consumers to buy at a wildly inflated price. Now this manager actually put the blame for the Spanish celery price hike on KIWI’s own pricing policy, rather than the farming lobby that for years has successfully fought for their tariffs. 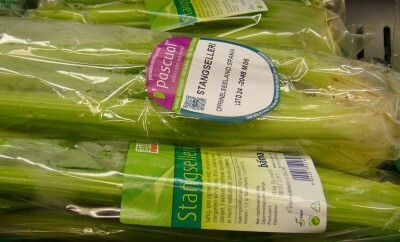 It’s doubtful the farmers will get any share of the additional 11 to 12 kroner charged for the Spanish celery, though. It’s more likely the gain from the price increase will stay in KIWI’s coffers, if anyone is now willing to buy it. At least one price-conscious consumer was not, and will be waiting until the Norwegian celery disappears from the market and the tastier, cheaper, imported celery returns. Cucumbers, meanwhile, were selling last week for NOK 19.90, up from as low as NOK 12.90 last winter.